How about starting a new job and on the third day, you arrive at work to discover that the building is surrounded by police cars? Shocked, you wonder if the joint was robbed but soon learn from a stern cop that the company is accused of criminal activities. Or another gig where the owner ushers you into his office and asks you to accompany him to a business meeting with a competitor. On the car ride to their site, he announces that he’s going to pitch them on acquiring his company! 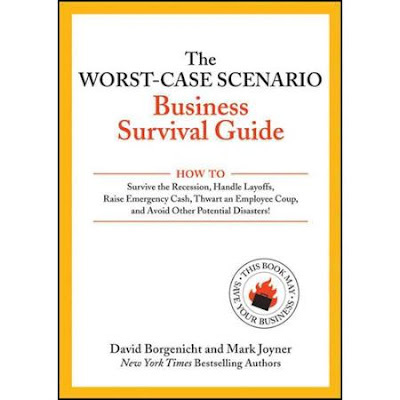 Those are two screwy situations that yours truly encountered that may not be “worst-case” scenarios, but neither are most of the relatively typical business problems depicted in this short and amusing little book. Previously, books in the “Worst-Case” series offered humorous and straight-faced advice for dealing with obviously over-the-top situations — how to jump from a bridge or a cliff into a river; how to survive if trapped in a lion’s cage; how to escape from a giant octopus — accompanied by retro-ish illustrations that evoked hokey how-to manuals from eras past. It was a winning formula, apparently, as a stream of follow-ups and brand extensions appeared, including a TV special. I haven’t read every volume, but my sense is that each took a similarly light and frivolous approach to the issues, even if some weren’t very serious themselves, like surviving a zombie attack. This new volume is VERY SERIOUS, however, and emphatically states so in both forwards by each of the authors of record. With no less than 25 “experts” weighing in with their advice, the pair, I’d guess, probably did the book’s outline and final rewrites. But this veritable Justice League Unlimited of kibitzers must’ve come up with a lot of stuff that was sliced, diced and concentrated to fit snugly into a book of just under 200 pages of text. But that’s still a lot of serious! Regardless, the book is divided into five chapters of “emergencies”: Financial, HR, Productivity, Sales and Marketing, and Executive, with a “Basic Training” summation at the end of each chapter. The presentation is pleasant enough and the intermittent appearance of Colin Hayes’ beautifully deadpan line art will elicit a chuckle or two. The advice is solid, simple and un-surprising. If you possess a minimal amount of common sense, you’ll know this stuff cold. If you’re just starting out in the world, this might be a useful book to study or one to bequeath upon a clueless co-worker who aspires toward management. Please be careful; if you hand it to an actual manager they may be insulted — and you could be mortally wounded — or your career will be. But it’s immeasurably more constructive than any cheesy, rodent-infested pop parable or other well meaning but quintessentially vapid folderol. And if you need a stocking stuffer or a present for a holiday office gift exchange, you can pick up a copy for under 12 bucks on Amazon.com, which will undoubtedly aid in surviving, at the very least, that potential disaster.